France has proposed setting up camps inside Libya in order to control the migration flows. Macron has acted alone once again illustrating that the EU design fails. 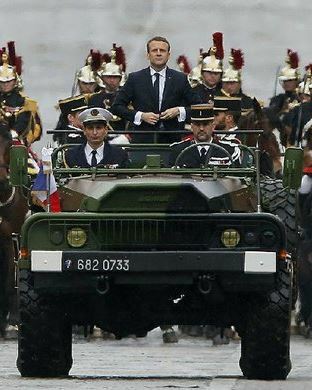 Macron is once more pursuing the objectives of a neo-colonial power restoring France to its former glory not unlike Putin. Macron wants to control Libya settling in the area taking control of the country thereby extending its sphere of influence to restore its former colonial glory to the Maghreb and also sub-Saharan Africa. Macron is acting unilaterally with no regard for the interests of the rest of Europe or the Mediterranean countries. This is the problem with the entire EU project. Merkel unilaterally opened the doors to all of Europe to the refugees to save her personal falling polls. Now we have Macron attempting to restore the colonial power of France over Northern Africa also without consulting anyone. It is bad enough that there is no democratic process inside Europe where all Europeans could vote in Germany on September 24th regarding Merkel, yet she is the dominant politicians that controls the lives throughout Europe. This is either one country like the United States and you surrender national power to Brussels, or you terminate Brussels and reduce the EU to simple a trade agreement. You cannot have it both ways.